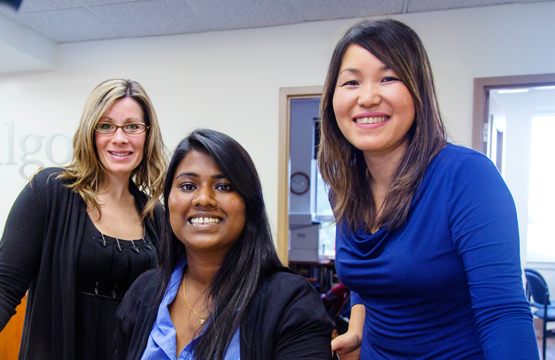 Algoma University’s Human Resources Department is dedicated to supporting and enhancing the success of the University, in particular its people, by providing services promoting personal and professional development and fostering a positive, safe and healthy environment. Algoma University is committed to creating an organizational culture of continuous quality improvement with a high focus on service excellence and satisfaction. Service excellence is achieved by ensuring that the people, processes, and technologies employed at Algoma are aligned to help us work together to meet (if not exceed) the expectations of Algoma University students, staff, faculty, and external partners. Administration, Faculty and Staff representatives have been working in collaboration on a strategy that will create an environment that focuses on service excellence. The goal is also to increase cross-functional communications to build transparency and a student-centered, friendly campus environment. Algoma University takes pride in offering a Service Excellence program to ensure students, faculty, staff and visitors are given a high quality service experience while on campus. Each and every day all members of the Algoma University community are asked to go above and beyond to ensure interactions with each other are courteous, informative and leave a positive lasting impression. The reward program at Algoma University will recognize and reward employees for demonstrating consistently high levels of service excellence while accomplishing normal job responsibilities. Enacting Service Excellence provides the foundation on which our attitudes and behaviours are shaped. Service Excellence when modeled by every Algoma staff and faculty member creates an extraordinary learning environment in which our goals of academic, professional and personal excellence are achieved. We are ambassadors of Algoma University. We share our pride in being a member of the Algoma University Community. Our attitudes and behaviours are guided by the values of the University. We contribute to an organizational culture of continuous quality improvement with a specific focus on service excellence. We recognize the importance of providing our services in an equitable, inclusive and customized manner by respecting the diversity of the community that we serve. We take responsibility in the interactions we have, and solve problems at the first opportunity. If a referral to another area is required, we do so in a personal manner. We appreciate the time of others and endeavor to provide timely, accurate, and quality information. We take pride in our work and our surroundings. We ensure that our physical environment is accessible, well maintained, and free of hazards. We demonstrate a high level of competence in our work and a willingness to share our knowledge. We value each other’s contributions. We continuously inform and educate ourselves in our work. We conduct ourselves in a professional manner and protect the privacy of others, whether in conversation or correspondence. We recognize and reward employees for delivering consistently high levels of personal attention exemplifying service excellence while accomplishing normal job responsibilities. Devon Sanderson, Rose Taylor, Shelley Mitchell, Brent Krmpotich, Paul Dupuis, Andrea Pinheiro, Raquel Lehto, Aaron Gordon and Meghan Majic. For more information, contact serviceexcellence@algomau.ca. This award program is intended to show immediate appreciation and recognition of individuals or teams for exceptional contributions and customer service inside or outside of their departments. The administration of this program is intended to be as simple and user friendly as possible. Employees are encouraged to take a minute to recognize their fellow employees for whatever they believe warrants praise. Any individual may submit a KUDOS Nomination Form to recognize a University employee for their special effort or service to anyone on campus. A team member handles a challenging situation well and the customer/student is very satisfied. A team member responded to a work related incident/concern outside of their normal work hours to ensure a customer/student was not left in a difficult situation. A team member has gone outside of their normal responsibilities and volunteered to assist another department for a particular task. A team member takes the initiative to welcome and assist a new employee/student to the University. KUDOS Certificate of Appreciation delivered by a member of Senior Administration as soon as possible after receiving the nomination. All recipients will be invited to an annual reception in March of each year, hosted by the President. Algoma University takes pride in offering a Service Excellence program to ensure students, staff and visitors are given a high quality service experience while on campus. Each and every day all members of the Algoma University community are asked to go above and beyond to ensure interactions with each other are courteous, informative and leave a positive lasting impression. Knowledgeable about various department responsibilities and the University in general. Executes their job duties in a positive manner. Willing to go above and beyond regular work duties to assist clients (both internal and external). Minimizes delays and assures timely follow up. Any student, staff, administrator or faculty member may submit a Champion Nomination Form to recognize a University employee. The form must be completed and submitted to the Excellence Service Committee by March 15 of each year. There is no limit as to how many winners are awarded annually. The recipients for the 2014-2015 year were recognized at a special recognition ceremony held on Friday, June 12, 2015. Congratulations to Michael Graydon, Nadine Robinson and AJ Pirillo as the 2015 Service Excellence Champions!